President Obama and President Dmitri A. Medvedev of Russia in London back in April. 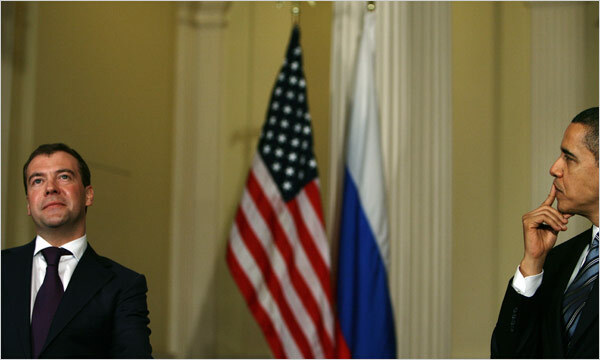 Mr. Obama traveled to Russia on Sunday to conduct negotiations. MOSCOW — Ahead of his departure for Moscow on Sunday night for a visit aimed at repairing strained relations with Russia, President Obama vowed not to sacrifice American support for greater freedom here and questioned the politically charged prosecution of a prominent Russian businessman. Mr. Obama raised concerns about the treatment of the businessman, Mikhail B. Khodorkovsky, who along with his partner has been put back on trial six years after they were first arrested. Critics say the new trial seems aimed at keeping Mr. Khodorkovsky, an opponent to the government who was once Russia’s richest man, in prison. In a television interview that was broadcast in Russia on Saturday night, Mr. Obama did not repeat critical comments that he had made about Vladimir V. Putin, the former president and current prime minister, who is widely considered Russia’s dominant leader. The interview with Russian television was conducted on Thursday shortly after Mr. Obama offered a different view of Mr. Putin in an interview with The Associated Press. The comment was seen as provocative, and some American officials worried that Mr. Obama may have been too sharp in taking on Mr. Putin while others argued that it let the president come in a position of strength. On Sunday, the Kremlin released the text of an interview in which Mr. Medvedev once again suggested that the United States needed to compromise on its proposed antimissile system in Eastern Europe in order to obtain a broader agreement on cutting nuclear arsenals. Mr. Khodorkovsky’s case is one of three that have come up as Mr. Obama heads here. Supporters want him to press Russia not only to free Mr. Khodorkovsky but also to do more to pursue the killers of two journalists, Anna Politkovskaya, a crusading war correspondent, and Paul Klebnikov, an editor for Forbes magazine. Ms. Politkovskaya held dual Russian and American citizenship while Mr. Klebnikov was an American of Russian heritage. Mr. Obama is sending top advisers to a memorial service to be held in Moscow on Tuesday for the fifth anniversary of Mr. Klebnikov’s death, and offered a show of support for Ms. Politkovskaya’s colleagues by answering written questions posed by her newspaper, Novaya Gazeta. Novaya Gazeta’s editors, Dmitri Muratov and Andrey Lipsky, asked Mr. Obama if he would ratchet back American attention to liberty issues in Russia. Mr. Khodorkovsky, who led Yukos, Russia’s most successful oil company at the time, was arrested in 2003 when he challenged Mr. Putin. He was convicted of fraud and tax evasion and sentenced to eight years in prison, while his oil company was effectively taken over by the state. He is back on trial on new charges of embezzlement and money laundering. Mr. Khodorkovsky’s parents hoped that Mr. Obama’s interest would prompt Mr. Medvedev to stop the trial and free their son. “I liked very much what Obama said,” his father, Boris Khodorkovsky, said in an interview. But Mr. Medvedev dismissed the possibility of a pardon, at least for now, comparing the case to the recent conviction of Bernard L. Madoff in the United States.